Spanish producer and engineer. He started in the first 70s with his brother Manuel Garrido on Los Soñadores, Galaxia and Flamenco, and later became producer and engineer. 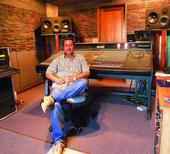 In 1980 he started his own recording studios (with his brother): Estudios Colores, later called Estudios J & M and then Estudios Musitron.